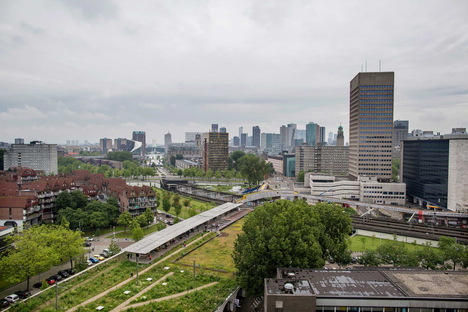 June 1 marks the beginning of Rotterdam's architecture month. For the third time, this event focuses on one of Europe's most architecturally eclectic cities and home to some of the leading Dutch architectural firms, such as MVRDV and OMA. 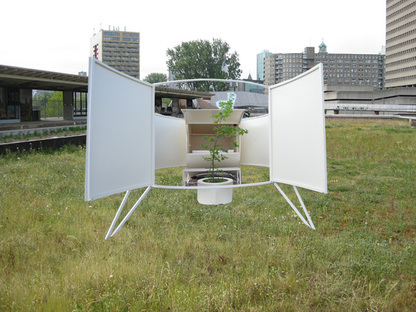 The International Architecture Biennale Rotterdam (IABR) is being held at the same time. The preview of the 16th International Architecture Exhibition - La Biennale di Venezia has just finished and other architectural events are already looming on the horizon. One of the musts for lovers of Dutch architecture is without a doubt the third edition of “Rotterdam Architecture Month” where Rotterdam turns into the architecture capital for the whole month of June 2018. Not only that, but this year, the International Architecture Biennale Rotterdam (IABR) is being held at the same time. This event builds bridges between architects, urban planners, designers, governments and the general public. The theme of this year's IABR is THE MISSING LINK. Designers are asked how they can contribute to reaching climate goals, such as the Paris Climate Agreement and the invitation to think about the city's future has also been extended to the wider public. This future will be displayed in videos, photos and scale models, and visitors can also attend lectures, debates and workshops. Rotterdam Architecture Month includes a culture-filled programme. 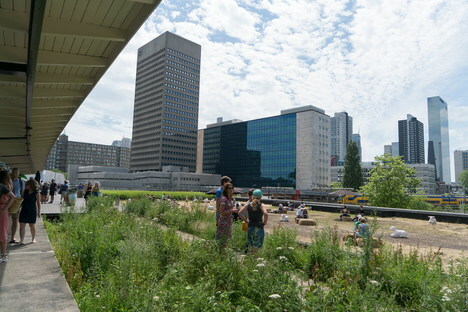 Apart from the traditional "architecture weekend" on 16 and 17 June, it is serving up a real highlight this coming weekend (2 and 3 June), with the “Rotterdam Roof Days” where you get the chance to visit more than 50 rooftops in Rotterdam to see the city from new and unusual perspectives. Have you ever wanted to wake up on the roof of a railway station? 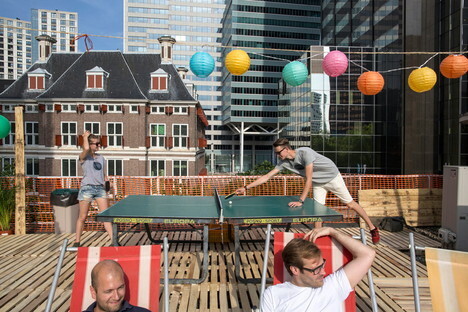 Well, here's your chance, with “urban sleep spaces” on the rooftop of Hofplein Station. Seven artists, architects and space designers showcase their lifestyle ideas in different ways, turning them into imaginative projects for sleeping by creating an experimental village on the experimental roof, where visitors can spend the night. 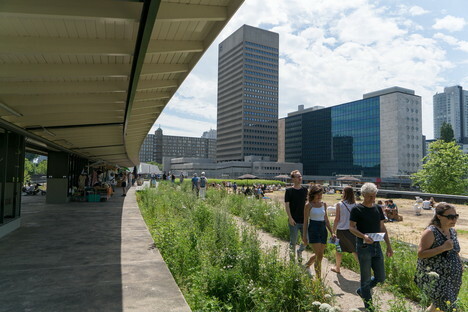 The rooftop of Hofplein Station will be open to the general public throughout the Rotterdam Roof Days. If, instead, you prefer to keep your feet on the ground, then why not take one of the “Rotterdam Tours” to see the city's most iconic architectural sights. You can visit Centraal Station, designed by Team CS, a work team formed of Benthem Crouwel, MVSA Meyer en Van Schooten Architecten and West 8, the Timmerhuis by OMA or De Markthal by MVRDV which also includes a Meet&Taste. Or again, you can explore narrow streets in the western part of Rotterdam with ZigZagCity revealing some very unexpected places where architects, artists, entrepreneurs and locals open up homes, shops and courtyard gardens to give you a peek into what's behind the facades. 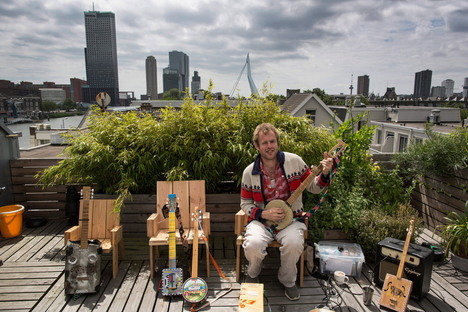 “Straatkijkers” (Streetviewers) is another interesting initiative developed by Lieven Poutsma from local art collective Observatorium, well known to the readers of Livegreenblog. For 100 days, from 9 June to September, you can visit lookout points placed along a route going from Kruisplein in the city centre to the up-and-coming neighbourhood M4H. Because Rotterdam is a constantly evolving city where even the residents are surprised by the innovations. So you can discover new streets near West-Kruiskade and Middellandstraat. As you may have realised, Rotterdam Architecture Month or “Architectuur Maand” is an event for everyone who wants to really explore the city's architecture. It's a perfect opportunity to find out about the stories behind the buildings, to experience a different dimension of Rotterdam. Give yourself some time in June to enjoy the city and the packed collateral events with conferences, films, workshops and exhibitions.